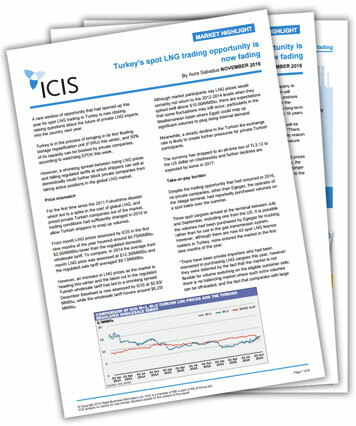 A rare window of opportunity that had opened up this year for spot LNG trading in Turkey is now closing, raising questions about the future of private LNG imports into the country next year. Turkey is in the process of bringing in its first floating storage regasification unit (FSRU) this winter, and 50% of its capacity can be booked by private companies, according to watchdog EPDK. However, a shrinking spread between rising LNG prices and falling regulated tariffs at which shippers can sell at domestically could further block private companies from taking active positions in the global LNG market.